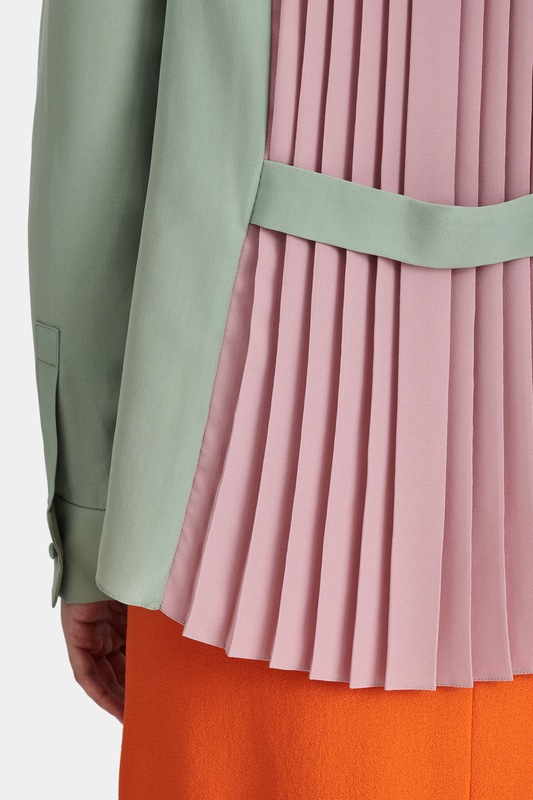 The moss green and terracotta rose colours of this blouse offset each other in an unexpected way. This blouse might look simple from the front, but it turns to reveal a pleated back inspired by the lines of the beehive that moves with every step you take. -Silk Crepe de Chine -Pleated back -Contrast front placket and pocket detail. 100 % Silk; 100% Polyester terracotta rose details.Dry Clean Only. Bozena Jankowska creates elegant, and expertly designed clothes that are made to last. She is part of the Slow Luxury movement: clothes should be as beautiful on the inside, as they are on the outside. Created from high quality materials, and produced in the best possible conditions. Inline with this philosophy, Bozena Jankowska cuts out gratuitous waste, and only creates what is needed; producing capsule collections which offer made-to-order, luxury clothes. Ultimately, Jankowska dresses you to look and feel amazing. She believes that anything worth having is worth waiting for. And once you have it, you appreciate it all the more. Her latest collection was inspired by the call to protect the declining bee population. Healthy bees are essential for human life. So, she partnered with bee-saving charity "A Bugs Life" to donate a percentage of her sales to help their cause. She wants to dress women who love to look and feel stylish and beautiful, who care about social and environmental issues- whilst reducing the environmental impact of the fashion industry. The thought behind each piece shows the depth of Bozena’s research into her inspirations. The print of the Manuka Jacket is inspired by the fine hairs which cover the bumblebee. When studied up-close, these hairs look like small feathers. We gladly accept returns and exchanges. As each collection is in limited numbers, we can only accept returns if items are unworn, still tagged, returned within 30 days of delivery. Please contact me within 14 days of delivery & ship items back within 30 days of delivery. I don't accept cancellations. But please contact me if you have any problems with your order. Conditions of return: buyers are responsible for return shipping costs. If the item is not returned in its original condition, the buyer is responsible for any loss in value.